Convert-A-Bed by InnoMax is not a collection, series or brand of mattresses. It is featured in two InnoMax brands, Comfort Craft and Luxury Support. Comvert-A-Bed is a concept, developed into a system, of changing the overall firmness on either side of a two-person mattress. 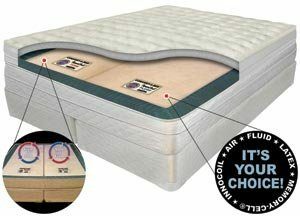 While purchasing a bed, the customer chooses what type of support to use in the bed. 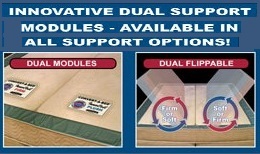 The model of the mattress above the support cores is the same, while the support mode is optional. There are five support modes to choose from: air, fluid (water), springs, latex, and Memory-Cell (similar to memory foam). Take for example, a King sized bed. It has two Twin XL support modules. A support module is self-contained, individually enclosed, For all but air and water support, the module is firm on one side and soft on the other. Turning the module over switches the firmness of that side of the mattress. Since the firmness of a softside fluid chamber is set, the specific chamber for each side is determined at purchase. And since the firmness of an airbed is determined by pressure in the air chambers, there are separate pumps and controls for either side. For fluid support, there is one additional feature, separate heater controls for either side. Because of the weight, heavier foundations are provided for waterbeds. InnoMax has 20-year limited warranties for its Convert-A-Bed models. They are available through several retailers. Fluid support versions can also be found at dealers specializing in waterbeds, and air support versions at airbed dealers.